Home Companies Bluetrend (Shanghai) Industrial Equipment Co., Ltd. Swing check valve, also known as one-way valve or check valve, its role is to prevent the backflow of media in the pipeline. The opening and closing parts are opened or closed by the medium flow and force to prevent the medium from flowing back. The valve is called a check valve. 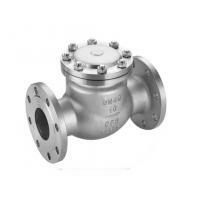 Check valves belong to automatic valves. They are mainly used in pipelines where media flow in one direction. Only one direction is allowed to flow in order to prevent accidents. Such valves should normally be installed horizontally in pipes. 5. The valve flap is a swing type. The flow channel is straight through, and both horizontal and vertical pipes can be installed."